Narrowly defeated in the Autumn Stakes by Andre Fabre’s Persian King last time out, Magna Grecia stayed on best of all to narrowly deny Charlie Hills’ Phoenix Of Spain. Stablemates Western Australia and Circus Maximus ensured the race was run at a solid gallop, but it was Donnacha O’Brien’s mount who just prevailed by a head as the 2-1 favourite. 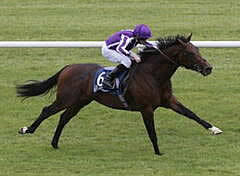 O’Brien said: “I’m delighted with him, he’s still a bit babyish but he’s coming forward lovely. A stewards’ inquiry was called as there appeared to be contact between the first two, initially when Magna Grecia moved out from behind his stable companions to make his challenge and then just before the line, but there was no change to the result. Coral offer 16-1 about Magna Grecia for next year’s Derby, but O’Brien snr is far from certain about the limitations of his stamina. He added: “He would have learned a lot today. He had to knuckle down which he did the last day too. “We thought he might be a miler, but he’s out of Galileo mare which gives him a chance. “I always thought if he got a mile we’d be delighted. Maybe he will stay further. He went on: “Donnacha thinks there’s a chance he’ll get a mile and a quarter. He was happy with him and said he put his head down and battled for him. “The lads usually look at the Guineas and we train them for that and see after that. Hills was thrilled with his colt’s performance and is looking forward to next year. He said: “He had the form and he’s a seriously good horse. He’s had a great season and has got the mile well. “He’s a nice horse to look forward to next year obviously. Jamie Spencer, rider of Phoenix Of Spain, was referred to British Horseracing Authority Headquarters having been found guilty of using his whip above the permitted level but it was his fifth offence in six months which warranted between two and six days. Vertem Futurity Trophy was first run in 1961, and it was originally called the Timeform Gold Cup. It was founded by Phil Bull, the creator of Timeform, and was backed by this organisation until 1964. The Observer started to support the event in 1965. The present grading system was introduced in 1971, and the Observer Gold Cup was classed at Group 1 level. The bookmaker William Hill took over the sponsorship in 1976, and from this point the event was known as the Futurity Stakes. The race was given its current title in 1989, when the Racing Post became the sponsor. The Racing Post Trophy is now the last Group 1 event of the British flat racing season. Five winners have subsequently achieved victory in the following year's Derby. The first was Reference Point (1986–87), and the most recent was Camelot (2011–12).